The Pittsburgh Penguins have signed forwards Bryan Rust, Scott Wilson and Tom Kuhnhackl to two-year contract extensions, it was announced today by executive vice president and general manager Jim Rutherford. All three deals begin with the 2016-17 season and run through the 2017-18 campaign. The Rust contract has an average annual value of $640,000, while both Wilson and Kuhnhackl have average annual values of $625,000. The three rookies have been integral components of the Penguins’ second-half turnaround, providing speed, energy and a blue-collar approach as secondary contributors. 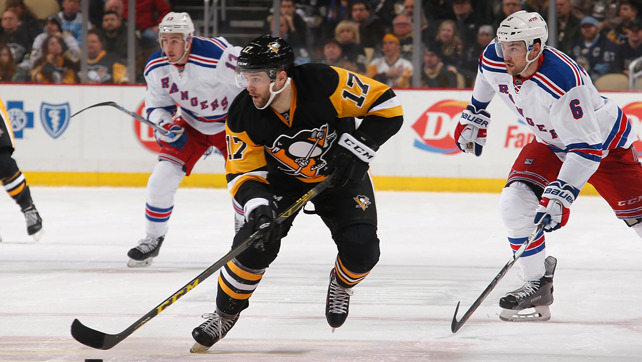 When the Penguins defeated the New York Rangers by a 5-3 count on Sunday, Rust and Kuhnhackl were on the ice in the final minute alongside Sidney Crosby as Pittsburgh protected a one-goal lead. They combined to set Crosby up for the Penguins’ final goal, clinching another key division win. Rust, 23, has logged the most NHL action of the trio, skating in 33 NHL games this season, tallying three goals, five assists and eight points. Since making his NHL debut in December 2014, Rust has 10 points (4G-6A) in 47 NHL contests. A 5-foot-11, 192-pound native of Pontiac, Michigan, Rust has accumulated half of his season point total in the past four games, when he has scored once and added three assists, including a career-best performance against the New Jersey Devils on March 6 when he had three points (1G-2A). Rust, Pittsburgh’s third-round (80th overall) pick in 2010, has also appeared in 63 AHL games with Wilkes-Barre/Scranton the last two-plus years, scoring 33 points (16G-17A). He has two goals in four AHL playoff games. Wilson, 23, has scored the most goals of the trio, tallying five goals, plus one assist, for six points in 24 NHL games this year. His first NHL goal came on Feb. 18 against Detroit and it began a three-game goal-scoring streak that is the longest by a Pittsburgh rookie since Jordan Staal in 2007. Last year, the 5-foot-11, 183-pound Oakville, Ontario native made his NHL debut with Pittsburgh on Dec. 2 against New Jersey, but suffered a long-term injury that night. 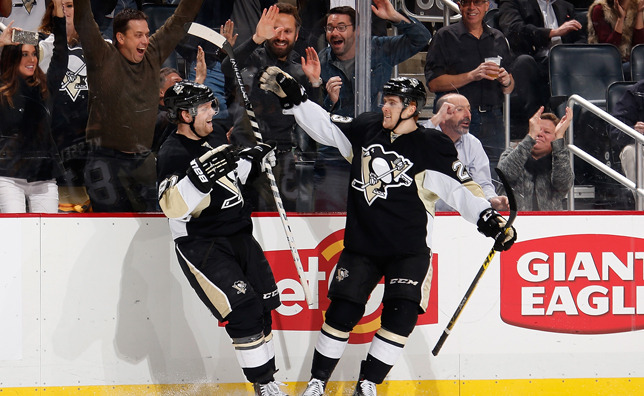 He came back to suit up for three of the Penguins’ five playoff games against the Rangers. Pittsburgh’s seventh-round (209th overall) selection in 2011, Wilson was leading the AHL with 22 goals this year at the time of his final recall. Wilson has 77 points (41G-36A) in 90 AHL regular-season games and four points (2G-2A) in three AHL playoff games. Kuhnhackl, 24, has the most professional experience of the three players signed today, emerging as a breakout prospect in his fourth pro year. Kuhnhackl has six points (2G-4A) in 28 NHL games, including his first NHL multi-point game against the Rangers on Sunday when he notched two assists. Kuhnhackl, who stands 6-foot-2, 196 pounds, skated in a combined 192 regular-season and playoff games the last four years with the Wilkes-Barre/Scranton Penguins of the AHL and the Wheeling Nailers of the ECHL on his way to getting his first crack at the NHL. 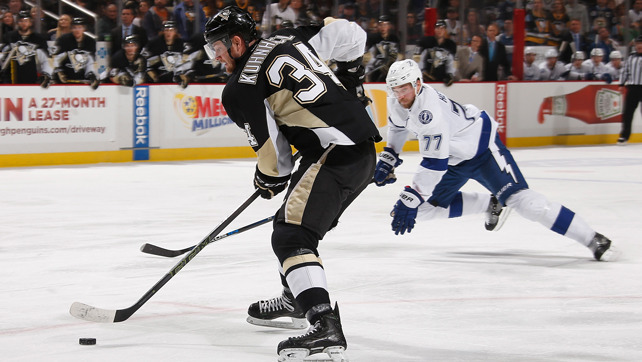 Along the way, Kuhnhackl persevered through several longer-term injuries. The Landshut, Germany native, whom the Penguins chose in the fourth round (110th overall) in 2010, had his best AHL start this year, tallying 15 points (7G-8A) and a plus-10 in 23 games prior to his promotion.